Taking Care Of Your Skin: What You Need To Know About Skin Cancer | PrimeYours! Everybody likes to get that nice golden tan so that they can look and feel better, but are you aware of all of the dangers of skin cancer? Before you get out the tanning oil while you are on the beach, read on to find out more about the dangers of skin cancer and what you can do to protect yourself. There are three broad categories of skin cancer – basal, squamous and melanoma. The good news is that the most serious kind of skin cancer – melanoma – is less common than the two other types. Basal cell carcinoma, the most common type of skin cancer, grows slowly and results from the growth of basal cells, the outer skin layer. The most common cause of this type of skin cancer is over-exposure to the sun. Vulnerable parts of the body include the nose, the ears, the face, the scalp and the neck, so you should make sure to check those parts of your body regularly for any skin abnormalities. The second most common type of skin cancer, squamous cell carcinoma, is also generally caused by over-exposure to the sun. However, people with fair skin and light hair are more prone to suffering from this type of skin cancer. If you have pre-existing skin conditions or burn marks, for example, that fact may increase your chances of getting this type of skin cancer as well. This is the most serious form of skin cancer. It can progress rapidly if left undiagnosed, and if left to grow deeper into the skin, can cause severe harm that may be irrepairable. Melanoma tumors are malignant and start in the melanocytes, the cells that produce pigment. 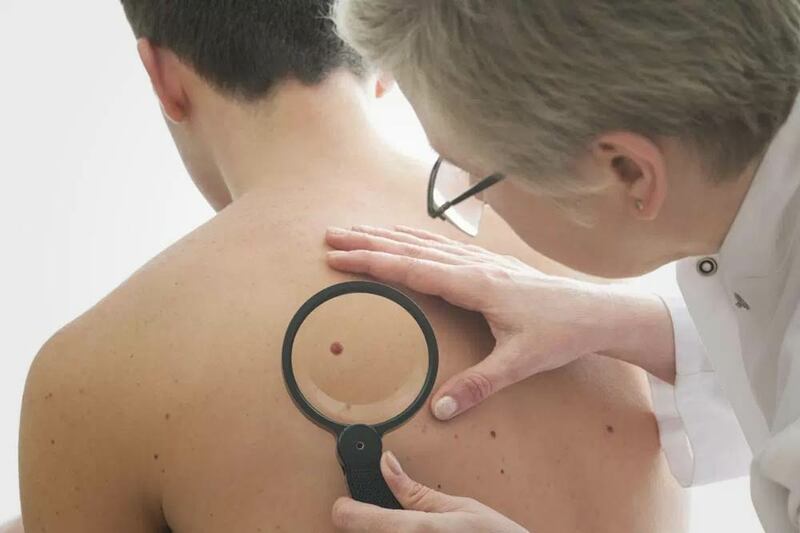 Not surprisingly, most melanoma skin cancers are located in moles and are brown or black in appearance. There are different types of melanoma that range from the most common and least invasive spreading melanoma which tends to grow on the surface of the skin only to invasive melanoma that has usually penetrated the skin deeply by the time it is noticed. When you are checking yourself for any irregularities, you should examine any existing moles on your body for any noticeable changes. Also, asymmetry in moles or growths may be a sign of cancerous growths. Color changes may also indicate the presence of skin cancer cells, so it is a good idea to report any of these changes to your doctor who can refer you to a dermatologist, if required. Keeping your body safe from the sun is the most effective way to prevent the development of potential skin cancers. Stay out of the sun, if possible, and while you are in the sun, make sure you cover your skin in SPF 15 sunblock or higher, depending on your skin. Long sleeve shirts and hats are also simply and effective ways to block the sun. If you are pale-skinned, have a family history of cancer or spend a lot of time in the sun, inform your doctor. That way, when you have annual physicals, your doctor can keep an eye open for any skin lesions or changes that you may not notice on your own. What kind of skin cancer might you have? How common is your type of cancer? Does a family history of cancer matter? There are many myths about skin cancer that persist. One common question, for example is whether tanning booths are better for the skin and if getting a tan from a tanning bed will protect your skin from the dangers of the skin later on. According to most dermatologists, tanning beds are not better for your skin. Most tanning beds use UVA rays but these can be just as harmful as UVB rays. It may be true that they take longer to damage the skin, but they are able to penetrate the skin deeper. Now that you know the basics of skin cancer and what to look for on your own body, you can help in protecting your skin from the dangers of sun rays. Wear sunscreen, keep your exposure to the sun to a minimum and wear protective clothing when you are outside. Also, you can schedule an appointment with a dermatologist to discuss any skin cancer concerns you may have. Dehydrated Food: It’s Not Just For Fruits! Sports to Get into Shape, FAST!